This loud and daring member of the family Corvidae belongs to the many black-and-blue species of Mexican jays. However, in our region it is the only one with such color combination. 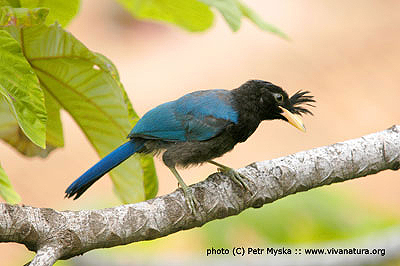 Therefore, should you come across a bird, which has entirely black underparts and beautiful metallic blue upperparts, rest assured that you are looking at the endemic San Blas Jay. Just as in many other species of local fauna, this bird’s distribution range is restricted to a fairly small section of Mexican Pacific coast. It can only be seen from the state of Nayarit in the north to Guerrero in the south. Although sexes are almost impossible to tell apart, it is quite easy to distinguish in between an adult and a juvenile. While both the young and the adults show the typical black and blue body color combination, the juveniles have brown eyes and yellowish bill and the adults golden eyes and dark bill. In addition, although both age groups posses an erectile crest, it tends to be more visible in the juveniles. 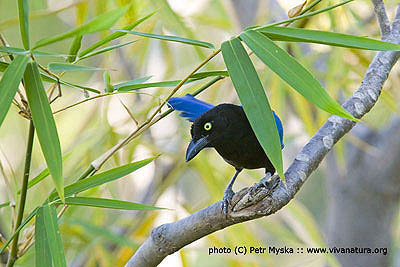 As all members of the genus Cyanocorax, San Blas Jay is a cooperative breeder, meaning, the birds hatched during the last season will help raising their brothers and sisters this year. The team spirit is not limited to breeding, though. San Blas Jays are almost exclusively found in groups. Flocks typicaly count in between 15 – 20 birds and forage low to high in canopy and often on or near the ground. In our area they are found principaly in arid to semihumid forests, forest edges and suburbs rich in vegetation.